With the Queensland State elections set down for Saturday, 9 September, CCN will keep readers informed of issues of particular interest to the community. Remember that if you can't make election day you can still apply for a postal vote or you can vote beforehand at a pre-determined location in the three weeks leading up to the election. One such location is at 32 Annalyese Street, Sunnybank. Did you know that the Queensland State elections have used Optional Preferential Voting (OPV) since the 1992 State election? 3. expressing a full distribution of preferences (that is, marking every square in order of preference). Mrs. Farida Gool, mother of Nabaweeya Adams (mother-in-law of Yusuf Adams of Eight Mile Plains), passed away in Cape Town, South Africa on Tuesday 15 August 2006. Br. Meya, formerly of Afghanistan, passed away yesterday. We offer our sincere condolences to the families concerned and make dua that Allah (SWT) grant the marhoomeen forgiveness and Jannatul Firdous InshaAllah. A number of invited guests attended the official launch of the Queensland Islamic Awareness Week at The Premier's Hall in Parliament House on Friday (18 August). Professor George Saliba of Columbia University in New York City, a distinguished scholar of Islamic Science delivered the keynote address on the topic "The Islamic Bequest to the Western Scientific Tradition" in which he explained the origins of the Arabic numeral system, algebra, trigonometry and the many other scientific developments that have been the basis for much of the advancement of the civilizations of the world over the past millenniums. Explaining the importance of Sin, Tan and Cos to the computation of direction and distance is not, at the best of times, for the faint hearted. But Professor Saliba succeeded in demonstrating just that, in a way that proved both educational and entertaining - going by the audience reaction at the end of his lecture. The Awareness Week kicked off in earnest yesterday at the Gold Coast Mosque, with the road show moving to Kuraby Mosque today and various other venues during the rest of the week (check the CCN Date Claimer column below for the details). Taking a break with a cuppa. Quest Community Newspapers has launched a new community website called www.whereilive.com.au. The new site will be comprised almost entirely of content created and uploaded by the local Brisbane community. Whereilive.com.au is designed as a one-stop destination for communities to come together online. It allows people to post local news, reviews, pictures and events. They can form groups with people of similar interests and buy and sell their goods. The site also gives sporting and community organisations the opportunity to have an easy-access presence online and for businesses to link directly with local customers. Whereilive.com.au is constructed around postcodes so users will always get the information that is most relevant to them. If there is nothing uploaded from their postcode, the site will automatically map to the closest Quest paper area. Users will have to register to post information on the site but anyone can browse through the content without doing this. Enter the postcode 4112 when you visit the site and check out the news and events section. 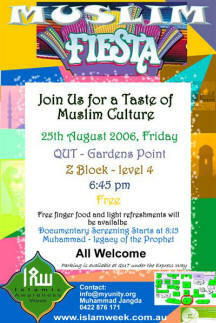 Muslim Fiesta aims to encapsulate the diversity of Muslim culture and facilitate an understanding of Islamic philosophy, which is all part of the celebration of Islamic Awareness Week 2006. The Fiesta is a culmination of art, food and entertainment and seeks to uncover the true essence of Islam. A documentary of the life of the Prophet Muhammad, Muhammad Legacy of the Prophet explores the fascinating life of the seventh century prophet who forever altered world history over the course of an eventful 23 years in an informative documentary filmed at the actual Middle Eastern sites where the influential Muhammad is said to have dwelled. The evening will commence at 6.45pm, Friday 25th August, at QUT Gardens Point Campus, Z Block, Level 4. Disgraced Australian commentator Dean Jones says he is "amazed and relieved" that Hashim Amla has forgiven him for his remarks during the Test match against Sri Lanka recently. Jones referred to a catch by Amla as "another wicket for the terrorist", a remark that he thought was off-air but had been transmitted live to South Africa. In an interview from his home in Victoria, Australia, Jones said that every person could learn a lot from Amla's humility and willingness to be gracious and forgive him "for my terrible mistake". "I have already apologised to him and I am so grateful that he has accepted that. I made an awful error, but he has accepted my apologies. I made that remark without even knowing him which was so wrong. Now I would love to meet him, sit down and have a chat and even help him with his career," said Jones. The Australian himself played 52 times for Australia and was an aggressive Test and one-day batsman. He admitted that the only time he had seen Amla face-to-face was before the first Test and that was in the nets where he went to acquaint himself with the players. It was part of his preparations for his stint in the commentary box, where he was employed by TEN Sports, a Dubai-based television company. He was on a contract of around $2 000 (about R14 000) a day, but has subsequently been fired. "I feel for the man and I cannot imagine what pain I may have put him through. But one day I'd like to meet with him. I could learn something from him about life - he has no doubt shown just what he is made of by so graciously accepting my apology without any strings attached," Jones said. "That tells you a lot about the man, his quality as a person, his humility and the way he thinks about life. I'd like to get to know him and he may instil in me a new sense of what life is all about. How stupid could I have been? I can't think what made me do so. How could I have put him into such an extreme situation? I deserved everything that has happened to me." Jones said he had been commentating for the past 10 years on television and radio. And that he was saddened by the fact that he had lost out on a lucrative television commentating job. "I'm to blame - there's no doubting that. I made the remark and paid a harsh penalty. However I will still continue to work on radio and pray that I do not do the make same stupid mistake again," he said. "It's been a harsh lesson for me and like Hashim has said that he would like to put it behind him I, too, would like to do the same." Would Jones consider coming to South Africa in the near future? "Why shouldn't I," he replied "I will have no hassles in doing so. I have admitted I created the situation and I will have to live with this stigma for the rest of my life. I'm not afraid and I am not going to duck and dive. If I do come, I'll be prepared to face the people of the country. I've got to take the criticism on the chin." Tickets to the fund raiser dinner for the relief efforts in Lebanon and Palestine are selling very fast. If you are planning to go, call Nora on 0422 349 786 as soon as possible. 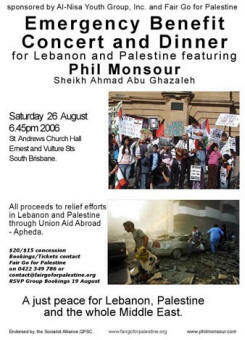 Don't forget it's also an opportunity to listen to two well-know singers, Phil Monsour and Sheikh Ahmad Abu Ghazaleh, who will be performing very moving songs about this conflict. All contributions to the cause will be channeled via Union Aid Abroad. Enough Rope: After the outbreak of the 'War on Terror' in 2001, enemy combatants captured in Afghanistan by American forces were sent to Guantanamo Bay. Dubbed the 'worst of the worst', among them was an Australian, David Hicks. Watch the Andrew Denton interview with Australia's David Hicks' attorney, Major Michael Mori. You will also find the full transcript of the interview here. Robin Williams on Angelina and Africa. Has Dean Jones suddenly become the Mel Gibson of cricket commentating? South Africa's Muslims include descendants of the powerful “Memon” merchant clans who migrated from Bombay. (The ones still in Bombay have a major stake in various businesses including Bollywood, IT companies and even smuggling!). South Africa also has a powerful community descended from Malays. These “Cape Coloured” Muslims have intermarried with other nationalities – it's not unusual to meet a Cape Town dude named Muhammad who is part-Malay, part-Dutch, part-Indian with surname “Mathews”. To get you and your family into the spirit of the Crescents Blood Drive, CCN is giving you a chance to win a fabulous prize. The competition is open to ALL CCN readers irrespective of whether you have registered or are qualified to donate blood. Send your answers to the following 15 questions to theteam@crescentsofbrisbane.org to reach us before 5pm Saturday 27 August. The entry with the most number of correct answers drawn from the CCN Inbox will be announced on Saturday 2 September at the Kuraby Community Hall. 1. What are the components that make up blood? 7. Approximately how much blood does the body contain? 11. What gives blood its red colour? I am so happy man in this dunjaluk when I have nays Crescent organization in Queensland Brisbane. I am so happy to be member of Kuraby Mosque veer popple so friendly and helping us for everything. Many thanks for published my photos. Since you published I have 56 Teflon cool to Questioning me and so happy people to see they photos in internet. I have to say this much this tam Kuraby mosque is most tidy and clines mosque in Queensland. Every tam people putting shoos in a shelf. No more triable to telling put the sous in shelf Itch other reminding. Still we have same problems whit uneducated driver ho parking all tame out of paring spies witch spies was reserved for Ambulance, Flayer brigade or police. Next aim I will get Rego number and get publicly kritzayet them for the benefit an fays to low and regulation of parking in Queensland I will get fool details name an other information if people "NothyPiople" persist parking. Yes summon com to let to pray. I advise to them Please star driving 5 minute earlier do not vat last minute and rash and parking car and proprietors upsetting your barters who strictly preceding parking daily. May Allah reword you all for bin god Boys.